Today I’m talking a bit about Forest Born by Shannon Hale. I discovered Shannon Hale’s books about a year and a half ago. I think I have mentioned before how much I love her books! I read several one right after the other when I first found her books and am finally getting to Forest Born. 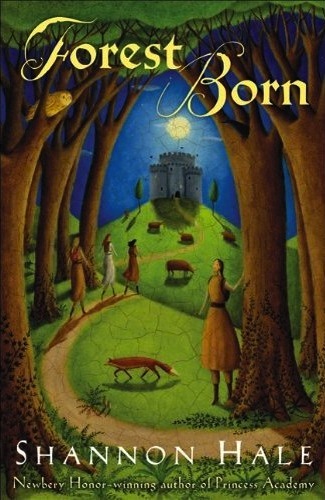 I love the Books of Bayern with Forest Born being the fourth and final book of the series. I am always a bit wary of sequels because it can be hard to find a sequel that fully lives up to the original story. I was pleasantly surprised by Forest Born. It continues the compelling story of language, friendship, and self discovery that the previous books begin. I definitely recommend it! Forest Born follows the coming-of-age adventures of Rin, younger sister to Razo who we meet first in The Goose Girl and who is central to the plot of River Secrets. Rin is the youngest child and only daughter of her Mama and lives with her large family (called Agget-kin) in the forest. The first part of the story follows Rin as she develops a closeness to trees and seems to be able to communicate with them. This relationship is hindered, however, when she forces her niece to do what she says and later tries to get a local boy to kiss her. This disconnect with the trees causes Rin to leave the forest with her brother Razo and his girl, Dasha. She goes with them to the city and begins a journey to rediscover who she is. The way Rin communicates with the trees is so clever. Instead of talking back and forth with them, she seems to become one with the tree and experience time as they do–stationary contrast to the chaos and change around them. As Rin learns to allow herself to be seen by the trees, she grows closer in her connection to them. I enjoy the characteristics that Hale gives trees–calm, stalwart, peaceful, unmoving, and strong. We see Rin develop many of these characteristics as she seeks to learn more about herself. In the city, Rin is assigned to work as a lady’s maid to queen Anidori, more commonly known as Isi to her closest friends. Immediately, Rin forms a close friendship with the crown prince Tusken whom she accompanies on walks around the castle. As she grows closer to little Tusken, Rin begins to notice strange behavior in other maids and seems to be able to read other people’s intentions correctly. When news comes of an attack on the King’s army, Rin is chosen to accompany Isi, Dasha, Razo, Enna, and Tusken to see what happened. Ultimately, Rin finds herself on a journey to discover a hidden threat in Kel where a mysterious queen claims to reign. I love the importance of friendship in this book. Rin comes from a family of brothers so I love seeing her form friendships with “the fire sisters” as she calls them. She comes to love and respect Isi, Enna, and Dasha for their skills with other languages of nature (including wind, fire, and water). But she also loves them because they include her, they trust her, and they love her back. It is through their friendship that these girls ultimately uncover the secret of the Queen of Kel and help defeat her. One of the most intriguing gifts of language that this book explores is the gift of people-speak. Those with this gift have an ability to control the actions of those around them. Enna calls people-speak a curse because often those with it get corrupted by their power and strength over others. The question is can someone have people-speak and learn to control it or even use it for good? I don’t want to give away too much because I really hope you all go and read this series! But as always, Shannon Hale creates a story that is vibrant and alive with unexpected twists but also creates characters that are endearing and memorable. I often try to predict how her stories will end, but I can never get it all quite right. And I love that about her stories. Any Shannon Hale fans out there? Have you read the Books of Bayern? Love the books of Bayern. 😉 My daughter and I are Shannon Hale fans.